My uncle became very ill (cancer) and I moved to Vienna to help my aunt. After his funeral, I went on holiday to Portugal. It was April, 25, 1974, when, relaxing at the Algarve, the Portuguese Revolution broke out! My story about this event was published in the Philadelphia Inquirer, Sunday, July 20, 2003, Section L. Looking back, I chuckle; but at the time it wasn’t funny. Anyway, I managed to make it to Santander, Spain, to join a Swan Tour: "Art Treasures of Leon and Castile." The highlight was the visit to the Altamira Caves. 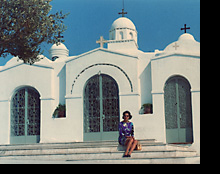 That summer I went to Greece for more "ruin-visits." (See Travels) When I was in Thessalonica / Thasos, I saw a brochure on the beautiful beaches of Halkidiki. So I went! And on the beach of Ouranopolis I met a Dutch couple and their little girl with whom I’m still in contact. Also an Austrian man: cupid’s dart; I gave him my Vienna address. I continued my itinerary: Crete and Rhodes. On the plane from Rhodes to Athens I chatted with a tall, very good-looking Greek MD. I was getting a connecting flight to Corfu, so I gave him my Athens hotel address and dates. Alas, fate had something else in store for me. The Cyprus War broke out! Every young Greek male was recruited. My hotel became "self-service." I contracted food poisoning. I managed to pack and fly to Athens to meet my Adonis. Was I devastated when he called that he was on the way to Cyprus! I cancelled my remaining itinerary and booked a flight for Vienna. While I was convalescing (virus/pancreas: strict diet), the Austrian man called. "Luigi" lived in a town on the way to Salzburg. We had a date. He told me that he was divorced and had an adult daughter. I wanted to be sure that he was single and insisted meeting his parents. They lived in Switzerland, he said. So we went to Zurich. I fell in love with his mother, she was a great lady; the single issue was confirmed. The end of September I took another Swan Tour to Persia/Iran. 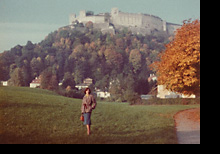 After my return, I moved to Salzburg. When Luigi and I separated, I returned to Vienna. May, 1976, I took a Swan "Roman Britain" Tour. The highlight was Chedworth Roman Villa; I still have my souvenir, a silver spoon: "Born with a silver spoon in the mouth." In August I had a tonsillectomy. The surgeon winked at me when I saw him a week later in his private office. He opened a bottle of champagne and, sipping, we sat like parakeets on the sofa. My luck that he was married! He proposed that we rendezvous at his hunting lodge in the "woods." I wasn’t interested playing Hansel and Gretel. He said I should think it over and he would call me after my return from my Spain trip. My birthday present to myself was a "Castilian Spain" Serenissima Tour. On my birthday, which I celebrated in Salamanca, his telegram arrived wishing me Happy Birthday. But I remembered my promise: never to date a married man. I wanted to continue my education; in Europe. 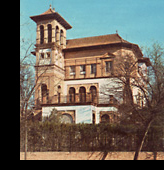 February, 1977, I settled for Columbus International College (affiliated with Ithaca College, NY) in Sevilla, Spain. This was the best decision I ever made because those years were carefree. I rented a furnished flat on Avenida de la Republica Argentina. I met a Spanish architect at the famous Rocio. He wore no wedding band so I dated him. One day I got a phone call, asking if this was a business number or "particular." Then Jim, the College president, called to inform me that the architect was married and, if I continued seeing him, his wife would have me deported or thrown into jail; an archaic law pertaining to "adultery." Needless to say, my motto became: hands off "any" Spaniard. A "mature student," I had more interaction with the professors than the young, happy-go-lucky 18/19-year olds who came from all over Europe as well as Nigeria and Morocco. 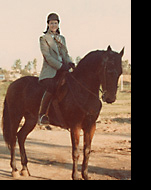 I learned riding from our Irish professor (economics) who owned a riding school. 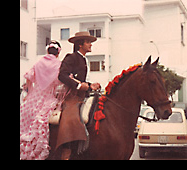 I rode on his tamest horse in the annual Feria de Sevilla. Such fun! June, 1978, I drove to the Netherlands to visit my sister and brother/his family in The Hague. On the beach of Scheveningen I met a friend of my brother’s wife who had been on vacation in Malaga. She had met a very nice Iranian man. I was interested in meeting him because I wanted to go to Iran. The University of Shiraz was affiliated with my University Museum in Philadelphia and I thought of perhaps enrolling to improve my Farsi. She gave me his address and I wrote him a postcard, giving him my address and telephone number in Sevilla. I went to Scotland for Swan Tour "Scottish Castles, Houses and Gardens." Highlight: Rosslyn Chapel (The da Vinci Code!). I stayed in Edinburgh. David and Barbara Wemyss had asked me to help celebrate a Save the Children fundraiser at their place in Longniddry. I had met them on my Serinissima Tour. Barbara teamed me with a tall, handsome widower (two small daughters). I declined dating him. I (Zen Buddhist) wasn’t going to marry a Roman Catholic! I went to London, having been invited by Betty Hussey (Serenissima Travel) to spend a weekend with her at Scotney Castle in Kent. Of course the castle is a museum, so I stayed at the more modern mansion. Betty’s husband was the famous Christopher Hussey who wrote for Country Life magazine. Then I took a Swan "Tudor, Elizabethan and Jacobean" Tour. I returned to The Hague. On my return trip to Spain, I took along my 12-year-old nephew. We had a great time sightseeing; getting lost several times! Cintra Castle near Lisbon and the lighthouse at Faro were his favorites. I taught him how to check in at hotels and to pay restaurant bills (check items ordered). The Iranian man called. After I dropped off nephew at Malaga airport, I drove to his house. We had a wonderful time talking about Iran, especially about Hafez. Sufis at heart, we were instant soul-mates. Ahmad was a widower and had two adult children. Every weekend we commuted between Malaga and Sevilla; once at my place, then at his house aptly named "La guarida de las mariposas" (the abode of the butterflies). Butterflies are a symbol for the soul. For my fortieth birthday I bought a horse: Castañero. Ahmad and I planned to go to Iran for the Persian New Year in March, 1979. But then the Iranian Revolution broke out in January! Ahmad decided to stay in Spain. In the fall I moved to Marbella and Castañero was stabled at Estepona. Hordes of Iranian refugees migrated to the Costa del Sol. Within two years they had opened a school and businesses. Social life was "hectic;" besides our Iranian clique we made friends with Germans, French, Austrians and Spaniards. Summers were like a merry-go-round of events when the Costa del Sol was inundated with tourists from around the globe. Marbella became popular with Lebanese, Kuwaitis and Saudis, their yachts "parked" at Puerto Banus. 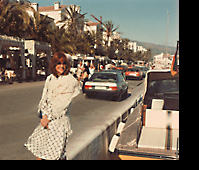 One summer the road between Puerto Banus and Marbella was bumper to bumper with Rolls Royces! Nightlife was booming; Regine of Paris opened a disco; a small but smart casino, and "clubs." Ahmad loved going to shows. Winters were quiet, less tourists. 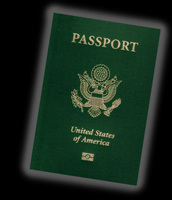 That’s when I visited my family: aunt in Vienna, siblings in Holland, and my parents in the States. Many foreigners bought estates. The king of Saudi Arabia built a palace, stable and a mosque; I was allowed to see it. Adnan Kashoggi’s mansion; he gave lavish summer parties, Brook Shields often came. Ex-empress Soraya of Iran had a villa. The queen of the Netherlands bought property on the road to Ronda. Christina Onassis strolled the quaint streets lined with boutiques. And – of course – the pimps and their retinue arrived! And then the burglaries began and ruined everything. The Duchess of Alba’s place on the beach was hit twice. Then one day the apartment across from mine was burglarized. And Ahmad’s villa was broken into. The police just shook their shoulders; most burglars were French and Italians. So when the "crême-de-la-crême" stopped coming, moving to Mallorca, Marbella became like a ghost town. Castañero died. Ahmad became very ill. He suggested I return to the States. So, fall 1986, I contacted my sister’s best friend who was a realtor.